A VIN in Wisconsin and in other states acts like a serial number for vehicles. Therefore, a VIN lookup can provide you with a vehicle’s history including accidents, damages, safety recalls, title history and more. Fortunately, you can request a history report online for maximum convenience. 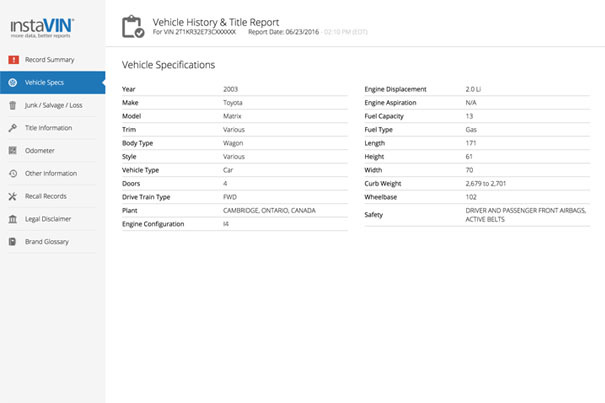 Your online VIN number check will provide you with access to a detailed report on the history of your vehicle. Additionally, you will be pleasantly surprised to learn how you can instantly view all of this information upon your request. Learn more in the sections below on how invaluable a VIN report is. 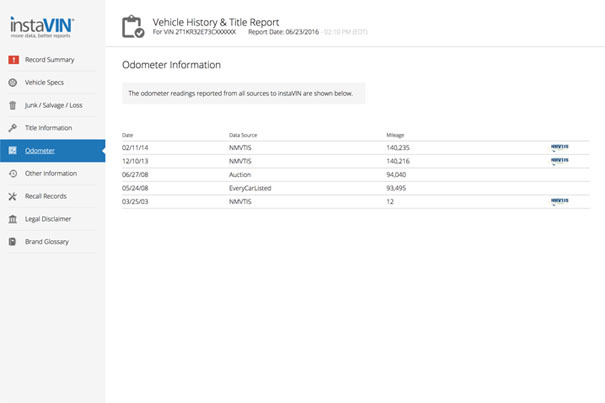 You can perform a VIN number lookup online to receive an instant vehicle report. Not only is an online history report incredibly convenient, but it is currently the only way that a report can be requested within Wisconsin. Fortunately, it is easy to get started in ordering a vehicle’s report. What info is a Wisconsin VIN history report? 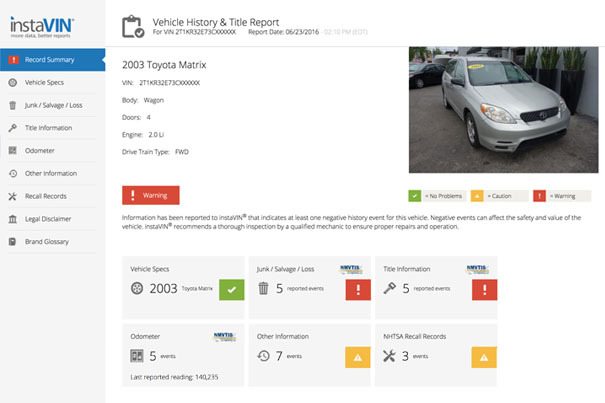 A VIN code lookup will reveal a number of key pieces of information about a vehicle’s history. Not only will a vehicle report provide a vehicle’s specifications, but you can learn more about the number of owners the vehicle has had as well as what the vehicle has been used for in the past, such as personal use, as a rental vehicle or as a taxi. By checking VIN numbers in WI, you can protect yourself from fraudulent activity. A vehicle report will provide you with information about reported odometer readings. While it is illegal to rollback an odometer reading to increase the value of the vehicle, there are still individuals who attempt this crime. Additionally, you will receive the theft status of a vehicle as well as whether or not there is a current lender on the vehicle’s title, which could result in the repossession of it if the loan remains unpaid. When you look up a VIN in Wisconsin, you will also receive real-time information regarding the vehicle’s accident and title history. If a vehicle has ever sustained an immense amount of damage, has incurred flood damage or has been a part of an unrecoverable theft, the insurance agency will have declared the vehicle as a total loss. 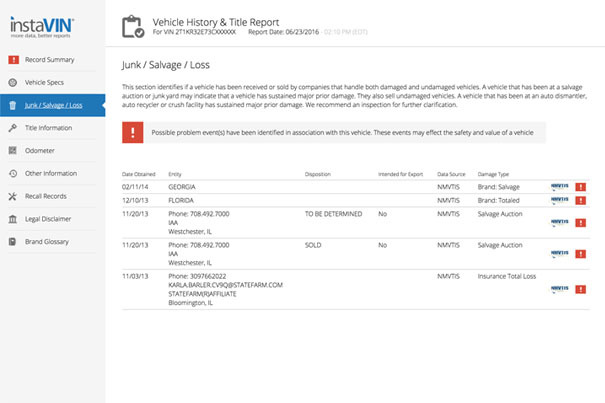 Total loss vehicles are issued salvage titles, making the vehicle harder to sell and insure. Most insurance agencies will not insure a salvage vehicle and those that do may offer limited coverage options or charge higher premiums. Lastly, a VIN number check will reveal any safety recalls from NHTSA and manufactures, including the severity level for injury risk as well as the recommended repairs that must be completed. Why would I need to perform a VIN check in Wisconsin? After learning how to check a VIN number, it is important to learn about the situations in which a vehicle report may be warranted. A Wisconsin VIN report is important in a number of situations, but can be especially valuable if you are interested in selling or buying a vehicle. If purchasing a vehicle, especially from a private seller, a vehicle history report can take the guesswork out of your purchase and help you to make an informed decision. Looking up a VIN number in WI can also be useful if you are trying to sell your vehicle. A clean VIN history can be used as a powerful negotiating tool when it comes to the sale price of the vehicle. It can also provide potential buyers with peace of mind along with complete transparency about a vehicle. This can ultimately aid you in the sale of the vehicle. In order to obtain a VIN number report, you will first need to locate the vehicle’s identification number. This number will be made up of both numbers and letters. For vehicles that are that are model year 1981 and newer, the identification number will be made up of 17 characters. Model years that are older than 1981 will have a varying number of lengths. On the front of the engine block. On the front of the vehicle’s frame, near the container that holds the windshield washer fluid. Directly above the rear tire, on the rear wheel well. Inside of the driver side doorjamb, visible when the driver’s side door is open. On the driver side doorpost, near the spot where the door latches. Beneath the spare tire in the trunk. Remember, your VIN number report request will require that you have this number. If you are still having trouble finding the vehicle identification number, you can contact the dealership or manufacturer in order to request additional guidance. If purchasing a vehicle, it is important that you ensure that you are provided the correct identification number by checking documents or the vehicle itself. In Wisconsin, a vehicle history record costs $5.